CKW Electrical, electrical contractors in and around Burnley, burnley electrician, colne electrician, rewires, barnoldswick electrician, part p registered electrician, napit. 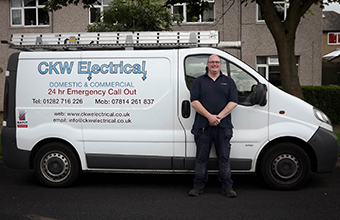 Welcome to CKW Electrical we are a small electrical contracting firm based in the North West of England, in a town called Burnley. The main bulk of our work takes us around the areas of Burnley, Colne, Nelson, Accrington, Barnoldswick, Brierfield, Blackurn, Bolton, Skipton and Clitheroe. We have the skills, experience and equipment to undertake the majority of work within the domestic and commercial sectors. With the introduction of PART 'P' of the Building Regulations, and the 17th Edition of the Wiring Regulations there are many new rules and regulations for electricians to comply with. All these new rules and regulations have been introduced to increase the safety of electrical installations in the home and in the workplace. With all this in mind, it is reassuring to know that we at CKW Electrical are fully qualified to the latest regulations, and are constantly building upon our qualifications and knowledge. CKW Electrical are members of NAPIT (National Association of Professional Inspectors and Testers) and are on the governments list of PART 'P' registered electricians. As electrical contractors, we are fully insured with both professional indemnity and public liability insurance. All work carried out by CKW Electrical is also fully guaranteed. If you need an electrician to wire a plug or re-wire your home, give CKW Electrical a call. 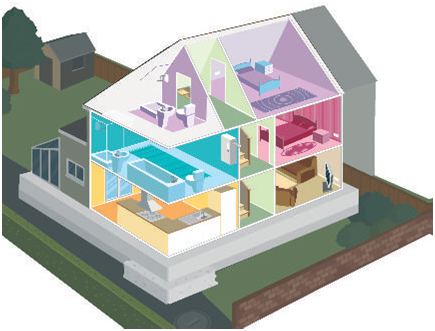 Electrical Installation Condition Reports (EICR). Consumer Unit (Fuse Box) upgrades. Power for garden lights water feature's etc. Upgrade sockets & light switches. The above list is not exhaustive and if you require anything at all, we are more than happy to supply a free no obligation estimate. All work is inspected and tested, and a certificate issued. Where the work is to be notified to building control, then all this is done by us at CKW Electrical. All this culminates in a reliable, hassle free, quality service as stress free as possible to you the customer.